Cartmel Priory was founded in 1189 by William Marshal, Earl of Pembroke and Regent of the Realm who played a key role in gaining King John’s acceptance of the ‘Great Charter’. His role in convening the meeting between the rebellious Barons and King John and in pursuing the agreement and sealing of Magna Carta at Runnymede in June 1215 was of paramount importance. No less was his revision and reissue of the annulled charter whilst Regent to the young King Henry lll which enabled the start of its prolonged journey into Statute. 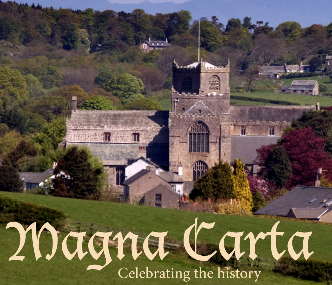 With the support of the village community, Cartmel is holding five days of celebration and medieval festivities in and around Cartmel Priory in Cumbria to mark the 800th anniversary of Magna Carta. The central focus will be on the historical Flower Pageant in the Priory which will be open every day from Friday through to Tuesday. On the Saturday and Sunday there will also be a living history Medieval Encampment, Tournèe and Fayre with son et lumière featuring the Priory’s founder William Marshal at the Priory at dusk. Two special Festival Services, one a celebration of ‘The Law and Justice’, led by Cartmel Priory’s Organist and Choir, the other a ‘Songs of Praise’ lead by Levens Choir and three concerts fill the Festival evenings. The concert programme features leading national early music instrumental group ‘La Serennissima’ and performances by local award winning musicians, ‘Amabile’ girls’ choir and Flookburgh Band whose concert will conclude with a firework display.